Katherine Wahl of ATIC lecturing on web accessibility. 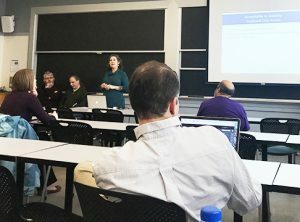 The Assistive Technology Information Center (ATIC) and Accessibility/Usability Team held two events over IAP for the MIT community. On January 24, we presented a talk titled “Web Accessibility: Encouraging Digital Diversity.” Katherine Wahl and Kathy Cahill spoke about the importance of making websites as accessible as possible to users with disabilities, and how to accomplish that by following basic accessibility guidelines in HTML. If you know of any groups or departments interested in having our team present on this topic, please email us at accessibility@mit.edu. We are happy to arrange something with you! At our annual IAP Open House on January 31, we provided information and demonstrations of various assistive technologies to visitors, including an Amazon Echo Smart Speaker, captioning telephones, assistive listening devices, magnification tools, text reading tools and web accessibility checking utilities. In all, about 30 attendees from the MIT community stopped by our beautiful, renovated space in 7-143 to learn more about what we offer. Please feel free to drop by or reach out to us at atic@mit.edu to find out more about our services.